Fun With Puzzles Brain Teasers Hidden Pictures Observation Test Picture Puzzles Puzzles for Adults Puzzles for Teens Can you find hidden C? 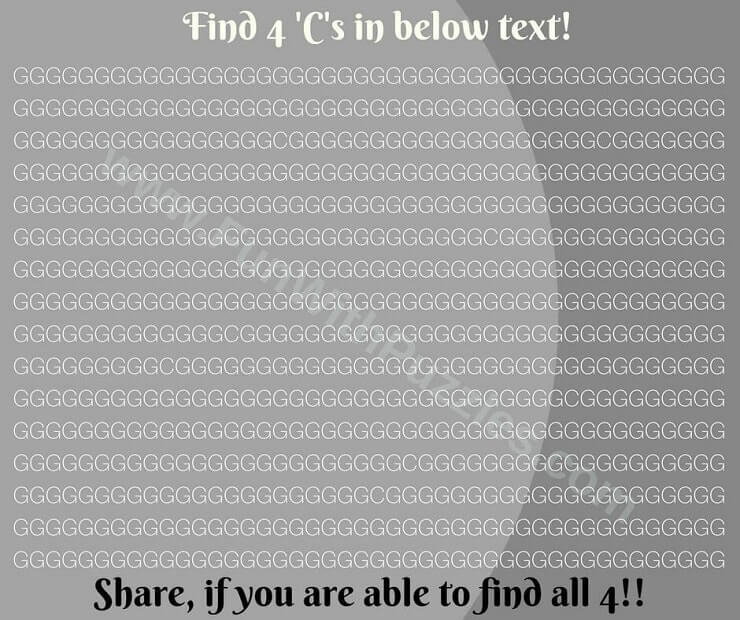 Can you find hidden C? Picture Puzzles to find the hidden Letters are very good Observational Puzzles in which one has to find the hidden letters in the set of another letters. Finding the given letter or number hidden in the set of another numbers or alphabets is very interesting brain teaser. Our eyes tends to miss while scanning the image. These kind of puzzles can be made very tough as well as very easy. 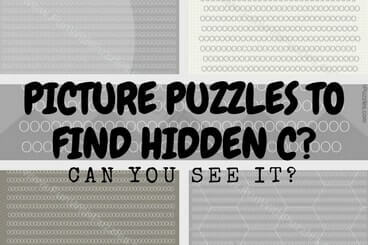 Here are some brain teasers in which you have to find "C" in all of the puzzles. In the first puzzles one has to find Only one "C". 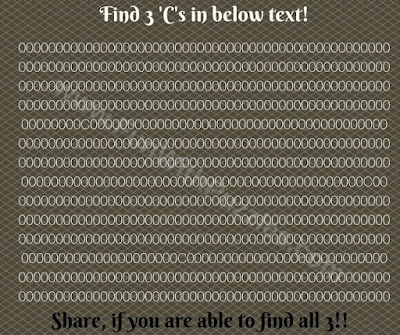 In the second one you have to find two hidden "C" and so on with last one being the tough and tricky one. 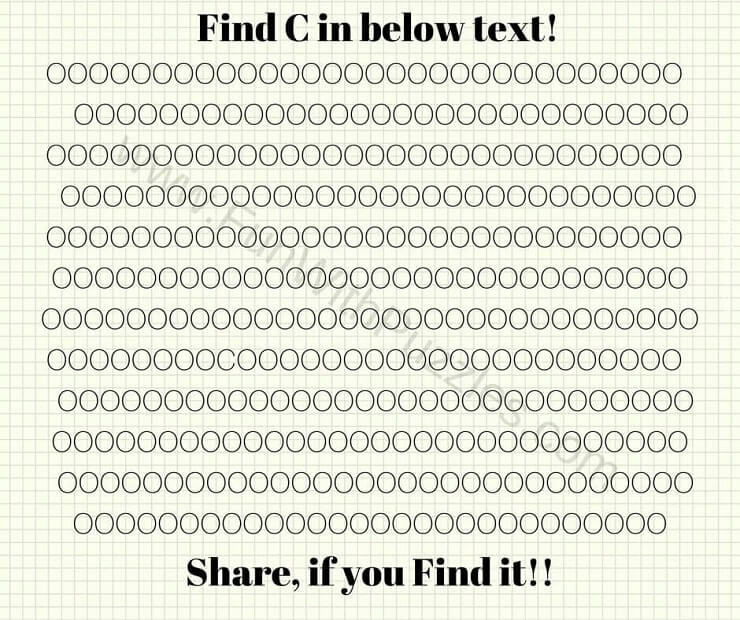 Lets see how many of these finding "C" puzzles you can solve as quickly as possible. Answers to these Finding "C" Puzzles will be given later. If you can looking forward for answer to any of these puzzles, do post your comments. 1. Can you find one C in group of O? Try taking Reading Challenge in case you are able solve above puzzle! 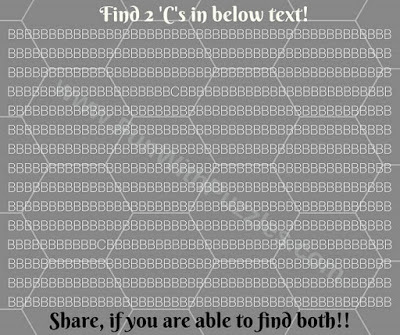 After you are able to find One hidden C in the previous puzzle picture, now its time to find two hidden 'C's in group B. This is an easy puzzle as C is immediately visible in the group of Bs. 2. 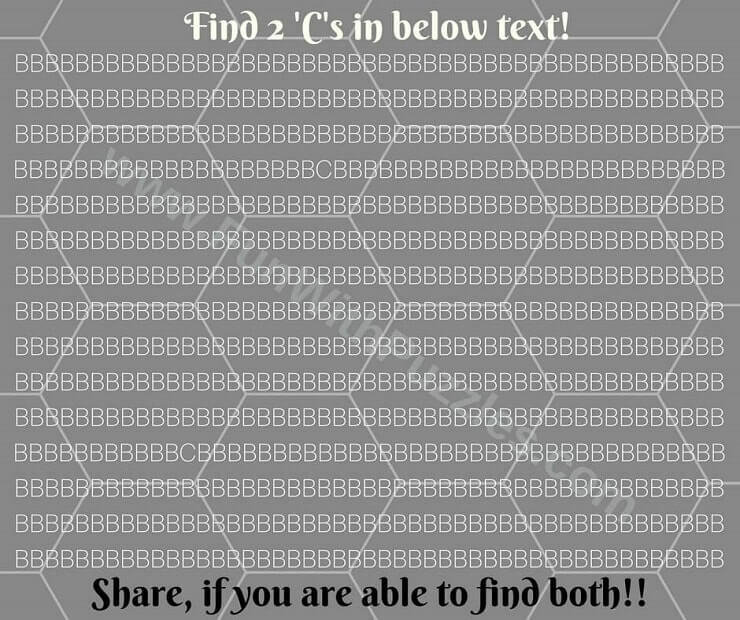 Can you find two 'C's in group of B? If you successfully found two hidden 'C's in the group of B in previous puzzle picture, do solve some Interesting brainteasers to challenge your mind. Now its time to make the puzzle tough. It is relatively difficult to find C in group of '0's. So next puzzle is to find three hidden 'C's in group of '0's. 3. 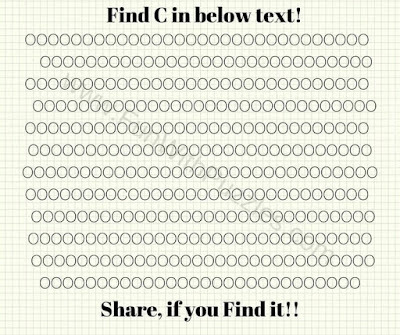 Can you find three 'C's in group of O? If you are able to find all the hidden 'C's in the previous puzzle pictures, try finding mistake in given picture puzzles. Now it time to make it tougher. 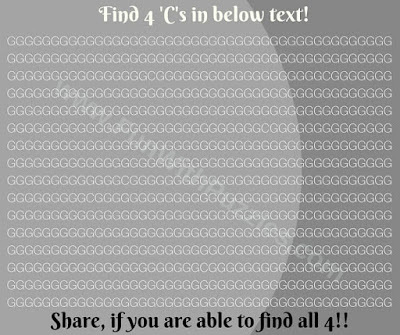 Now you have to find 4 hidden 'C's in group of G. Lets see if you can find all 4 'C's in one single scan of this picture? 4. Can you find four 'C's in group of G? 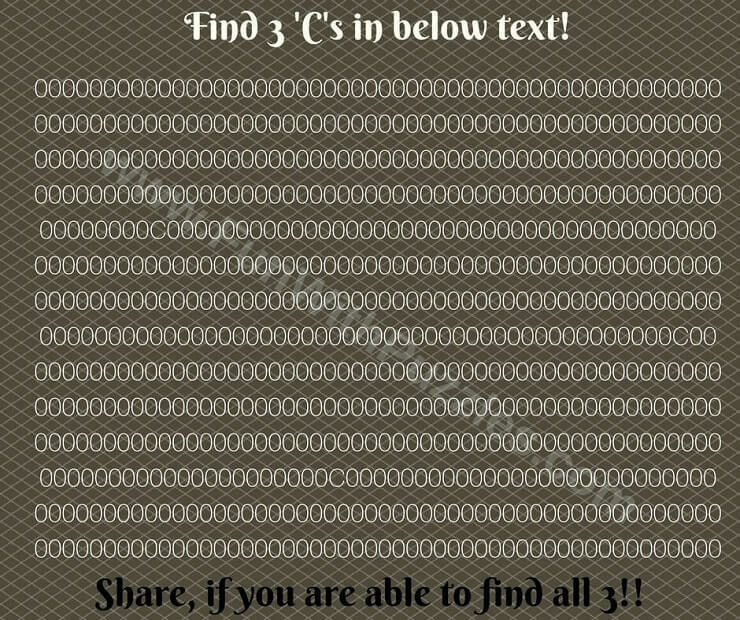 If you are able to solve all the four puzzles correctly then its time to try Eye Test for finding hidden Letters puzzles. After all the puzzles of finding hidden 'C', its time to make the challenge tough. 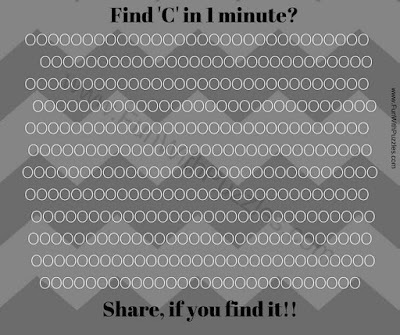 Lets see if you can solve this tough puzzle to find C in 1 minute time? Picture Puzzles to find hidden letters for teens: These are the picture puzzles in which your challenge is to find the given hidden letter in the similar looking pattern of letters or numbers. Tricky and cool brain teasers of finding mistakes: These are Picture Puzzles in which your challenge is to find mistake in each of the Puzzle Picture Image. Finding Hidden Faces in the Given Pictures Brain Teasers: These are very interesting Picture Puzzles in which you have to find the hidden faces in the given puzzle image. Jumbled Words Exercises with Answers: These are the word brain teasers in which your challenge is to create as many words of size more than 2 using the given 9 letters for each of the puzzle. 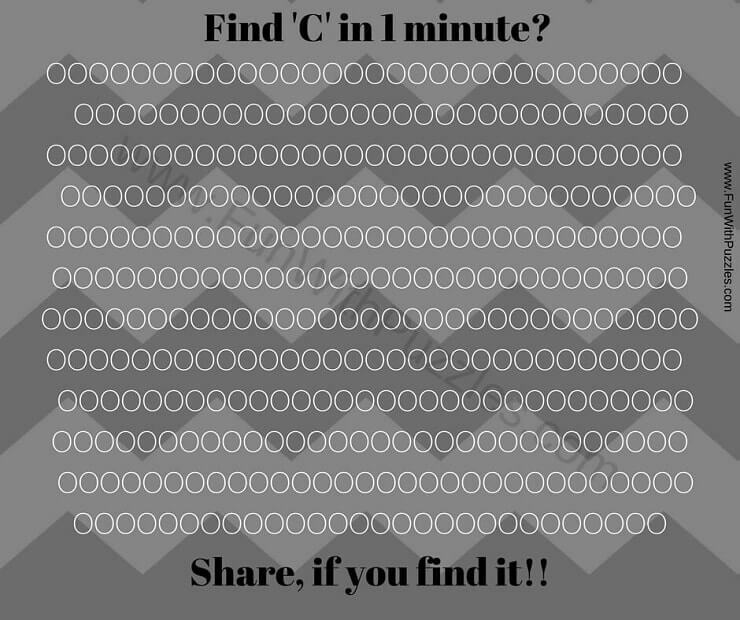 The C is in the first line itself where it saying to find "C". There is no C anywhere else. I think the answer is 'none'. There is no "C" in the word '1 minute'.